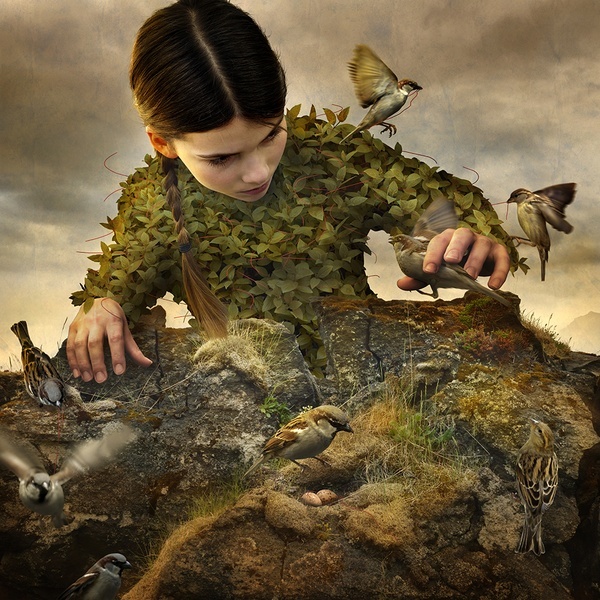 photo-eye Gallery New Work – Tom Chambers: Still Beating photo-eye Gallery is proud to introduce Still Beating the newest series of photomontages by represented artist Tom Chambers. Based on dreams and musings, Chambers' work sits firmly in the expressive genre of magic realism, and Still Beating focuses on the vitality of life under threat and the contrast between bodily fragility and emotional fortitude. 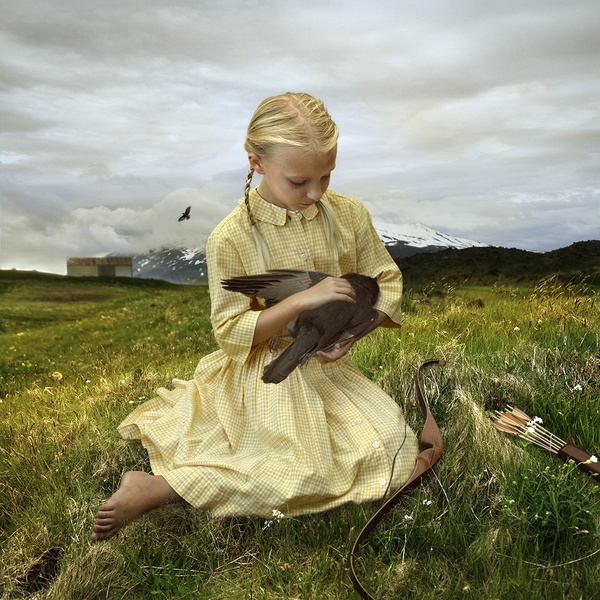 photo-eye Gallery is proud to introduce Still Beating the newest series of photomontages by represented artist Tom Chambers. For over twenty years now, Chambers has been crafting affecting single setting narratives where the fantastic mingles with the plausible to create compelling meaningful images. Based on dreams and musings, Chambers' work sits firmly in the expressive genre of magic realism, and Still Beating focuses on the vitality of life under threat and the contrast between bodily fragility and emotional fortitude. Gallery Director Anne Kelly spoke with Tom and asked him to share some additional detail about his process, the creation of one of Still Beating's signature images, and what's next for the photographer. Anne Kelly: Can you tell us a little about Still Beating; what were you thinking about while making the series? 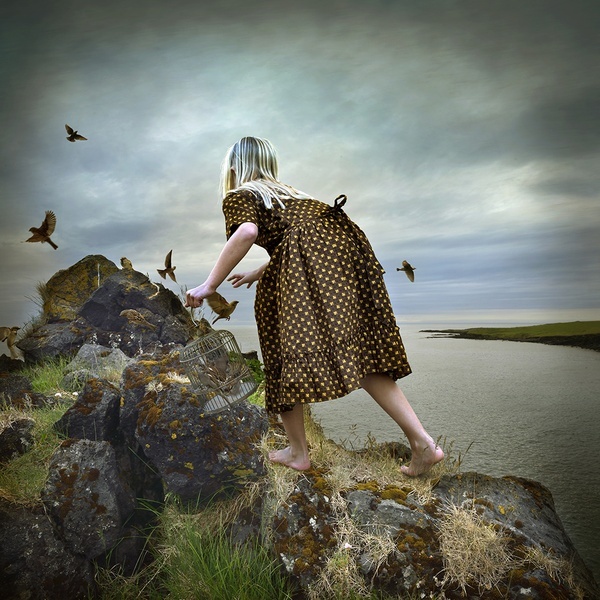 Tom Chambers: Since I began creating photomontage, storytelling has been part of all my series and something that has engaged the viewer. My hope has been that the viewer will look at my images, each of which contains an unfinished story, and then create his own interpretation of what's seen. As I began working on the Still Beating series, I wanted to strengthen the narrative in each of my images, while continuing to leave the meaning of the stories up to each individual viewer. 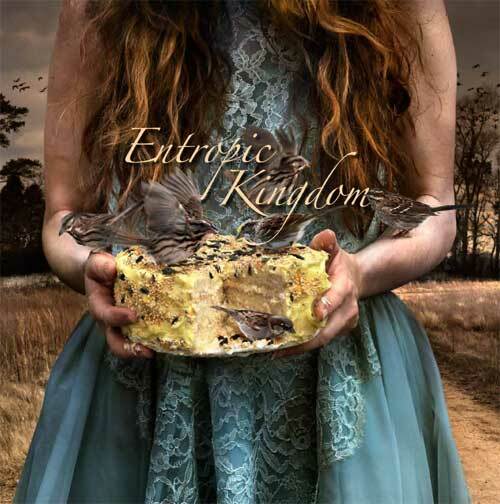 What in the world is going on in Hidden Aviary with the young girl covered in leaves and playing with birds? 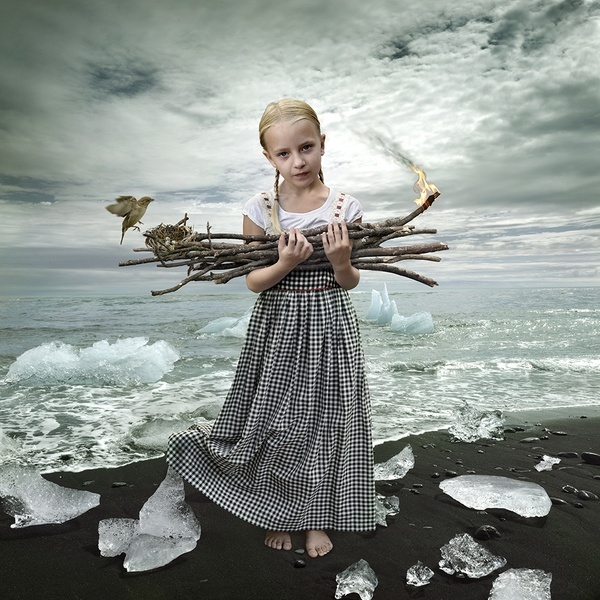 In Fire and Ice, how did that innocent child dressed in summery clothing collect wood on a beach littered with ice? Some of these things are not quite right. Magic realism has been a tool for me to create a strong narrative. I use magic realism to peak viewer's interests compelling them to take a second look because something looks different or improbable, and in Still Beating I use magic realism to enhance the narrative about the challenge of survival. No Glory in Regret pictures a young girl stroking a bird with a bow and arrow next to her in the grass. What will happen to the bird and the child? There don¹t have to be answers to these questions. I really just want to raise questions in the viewer's mind. AK: You have been creating photomontages for about twenty years now; how has your process changed or evolved over that time? TC: Although I had my first exhibition 20 years ago, I started working with digital images when Photoshop was first released around 1990. Early on, I was shooting with a Minolta 35mm film camera and scanning those transparencies with a film scanner, and it didn’t take me too long to realize that a medium format camera would be necessary for output to 20” prints. So, in 2004 I switched to a Mamiya 645 film camera and was able to print much larger. In 2007 I felt that digital cameras had advanced to the stage where the image quality was close to that of film. Not only that, but film and scanning costs were very hindering, so at that point, I started shooting with a Nikon D300 and later switched to a D800. I have also learned that image quality is very dependent on a sharp lens, and more recently have invested in multiple quality lenses. Photoshop software has also evolved in a major way since I first began experimenting with the software. In the early days, there was no such thing as using layers for the different elements. After layers for elements became available, the ability to work with adjustment layers was introduced, which meant you could independently modify each element of the constructed image. In terms of how I plan my images, I’ve always worked the same way. I typically do a thumbnail sketch of an idea and use that as a guide to shoot the separate elements. Although I often use images photographed while traveling as backgrounds for my photomontage, the elements typically are shot near my home, either outdoors or in a studio. AK: We see a lot of birds in your work; do they mean anything in particular to you? TC: To me, a bird symbolizes the expression of freedom. Many viewers easily connect to birds. And quite honestly, who doesn’t love birds? When birds are portrayed as being caught or restrained, it sometimes throws the viewer off balance or makes him uncomfortable. My goal is to help the viewer to emotionally connect with the image and to draw the viewer into the image. AK: Please choose an image from Still Beating and detail how it was made or what it means to you? TC: In making the image Garden Gate, I traveled to Portugal two years ago and had the opportunity to explore the Convent of the Capuchos. This ancient convent is set in a very rural area and upon entering you cross under a low stone arch which symbolizes leaving the material world and entering the spiritual. Trees are thick within the convent grounds and the stone buildings are covered with moss and lichens. I believe we were the only people there. I could visualize animals coming through the area during the late hours and I decided to illustrate that idea by using a deer walking down a set of steps to an open gate. 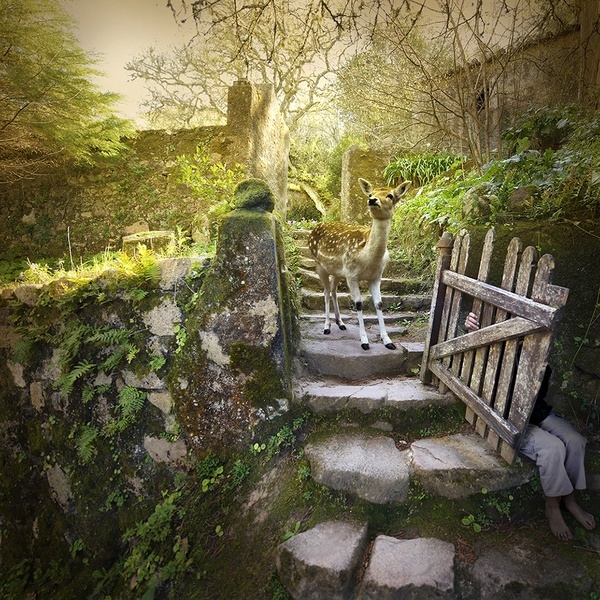 The deer itself draws interest to the image, but the addition of the boy partially hidden behind the open gate gives it a narrative. AK: We've heard rumors of a new forthcoming book; are you able to share any information about the project with us? TC: Several months ago, I was surprised and honored to be contacted by a representative of the Unicorn Publishing Group (London) who expressed interest in publishing a retrospective book of my work. The production of the book has started and the release is scheduled for Fall 2018. The is book entitled Hearts & Bones will be 208 pages in length and include my nine photo series. 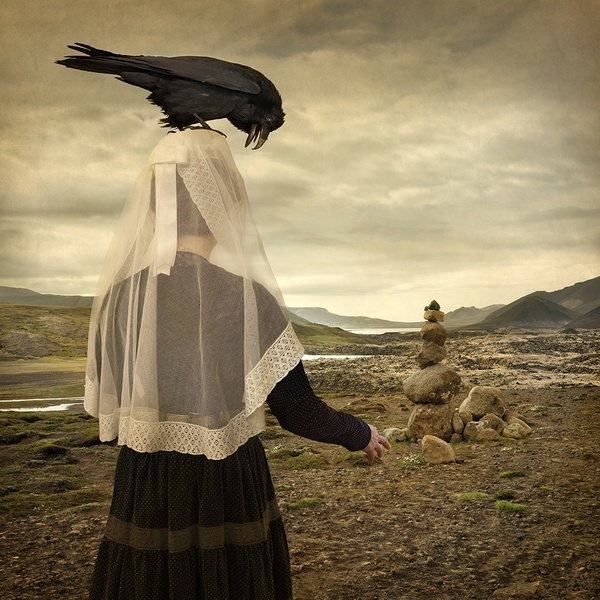 Archival Pigment Prints from Still Beating are available in limited editions in various sizes. Please inquire with Gallery Staff at 505-988-5152 x 202 or gallery@photoeye.com for more information, and to purchase prints.